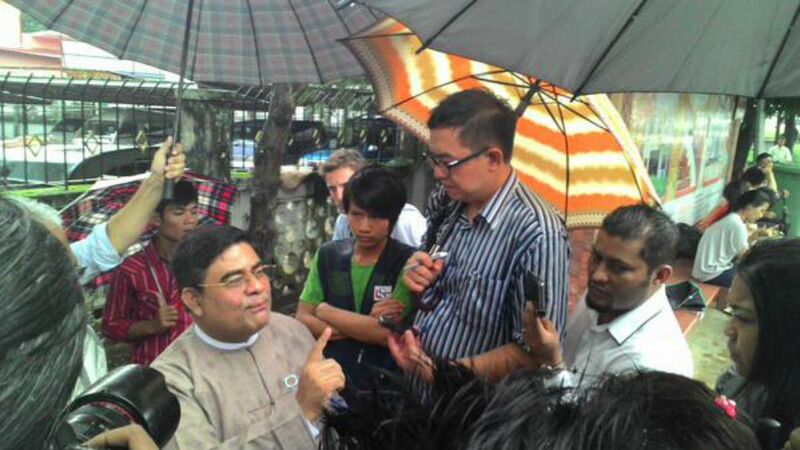 Rohingya MP Shwe Maung today defended his right to run in the election and said there is no doubt in his mind that his father was a citizen at the time of his birth. Speaking on the sidelines of a small press conference outside the National Human Rights Commission in Yangon, the Muslim MP said he was “surprised” when told last month that his father was not a Myanmar national, because he had been a career police officer who would have needed proper papers for work. Shwe Maung’s second appeal to a court in Rakhine state – where he planned on running as an independent, though he was formerly elected as a ruling USDP lawmaker – was rejected on September 1 in less than 10 seconds, he said. As a last-ditch effort he is taking his case to the Union Election Commission. He would not comment on what he planned to do if the UEC also blocked his candidacy. “Let me wait for that,” he said. One of a handful of Muslim lawmakers barred from running in the election, Shwe Maung was accompanied today by Malaysian MP Charles Santiago from the Asean Parliamentarians for Human Rights. Santiago had more forceful words, saying Myanmar's government had been “held hostage” to right-wing groups [Buddhist nationalists].